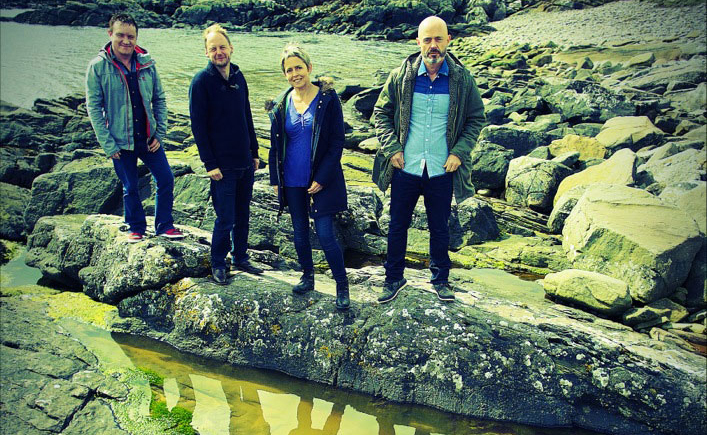 Originally formed in 1995, Flook is an Anglo-Irish band playing traditional-style instrumental music. Originally formed in 1995, Flook is an Anglo-Irish band playing traditional-style instrumental music. KS spoke with tin whistle and flute player Brian Finnegan about the band’s music, and their first trip to Kansai. Flook disbanded in 2008 only to return due to popular demand in 2013. Is Flook now a permanent thing for all the band members? We are enjoying playing music together again. I think that was the main factor in us re-grouping. We played a concert or two and it just felt right; so, as long as it continues to feel that way then we’ll follow our hearts… and we might even make a new record one of these days! Some great things have been said about the band in the press in past years. How would you describe the music and sound of Flook? We write instrumental music inspired by life and we bring it alive, exploring the rough outer edges of it. Some people hear a strong flavor of Irish music in it, some jazz or world, but we don’t write or source our tunes because they are of any particular genre. The sound of Flook is the sound of the four individual voices in conversation with each other… there’s a lovely Zen-like state of being when music flows like that, and the rational mind gives up thinking about what style of music it is. Japanese traditional and folk music has a strong following. How has the audience responded in the past to the Celtic-influenced traditional and folk music of Flook? This will be Flook’s third visit to Japan and we can’t wait to come back! We found that when we visited for the second time, there was definitely a devotion developing to our music from people buying the records and the word spreading. Because we play traditional dance music, there are no language barriers, instrumental music has the power to sweep you up in the pure uplifting joy of it and we find that Japanese audiences embrace that spirit in our music.